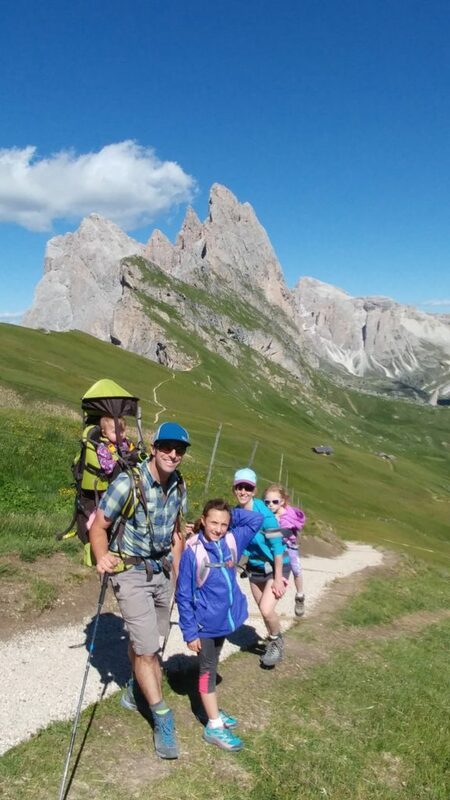 Dr. Jason Tanguay, a general dentist from Bozeman, Montana, hikes with his family in the Dolomites in northeastern Italy. I taught high school science for five years and realized it was not a lifelong fit with my personality. My younger brother was in a climbing accident where he lost seven front teeth. Seeing his rehabilitation really opened my eyes to dentistry as a profession. I love how it connects social skills with technical knowledge and hand-skills. Why are you an ADA member? At the most basic level, because of the advocacy and other efforts that help maintain dentistry as the awesome profession that it is despite outside pressures of all sorts. On a personal level, since I have gotten involved with organized dentistry leadership on a local and state level, it has given me as voice to impact policy. When I see something that I would like to change, my ADA membership gives me the backing and access to people with know-how and resources to try to make the change. Working as a mountain guide on Mt. Rainier in Washington. We would lead novice climbers up in the heavily glaciated terrain up to the summit at 14,411 ft.
What has been the best time of your career so far? Right now and if you ask me next week I will say the same thing. As I get to know my patients better and that relationship deepens, it becomes all the better to come to work. Also my clinical knowledge and skills keep improving which makes me enjoy each week more than the last. I’m hanging out with my wife and three daughters or outside skiing or trail running. I climbed Mt. Everest in 2004 while working as a guide for International Mountain Guides. this is my first time on this ada website , and i wasn’t going to click on the link for Dr Jeff Tanguay, since Ihave to embark on cont ed credits, but i was attracted to the photo (GREAT PIC) and then read the short article and being a skier myself, and reading about Jeff’s fun activities,RANIER, EVEREST I’d like to get TO know him, maybe ski at Big Sky w him, having been there twice and loved it! our family went to Alaska last summered loved it, so… just thought I’d reach out to see if we can connect. I just purchased fly rods for myself and son this past Christmas, so maybe we could meet? Bill Ziegler 570-814-9191 .We are 2 hours west of NYC if you’d ever want to come east foravisit/tour…p.s. Going skiing tomorrow and Sunday at Killington in the big snowstorm ;-). THANKS ADA. SINCERELY, Bill.